Sleep apnea is a type of sleep disorder where people stop breathing in their sleep (or they breathe in a very shallow manner). This can last for seconds and in some cases it may last for minutes. This period of little to no breathing could happen as many as one hundred times over the course of the night. Often, people do not realize they even have sleep apnea until their significant other notices snoring or that they are gasping for air while they are sleeping. This shallow breathing causes those with sleep apnea to move out of a deep sleep and into a light sleep, therein interrupting their sleep cycle and causing daytime sleepiness as a result. This is one symptom of many. Sleep apnea can also result in GERD, morning headaches and cognitive decline in the daytime, to name only a few. Sleep apnea is serious. If not treated, it can go on to cause a number of serious health problems, including high blood pressure, diabetes, stroke and even heart failure. 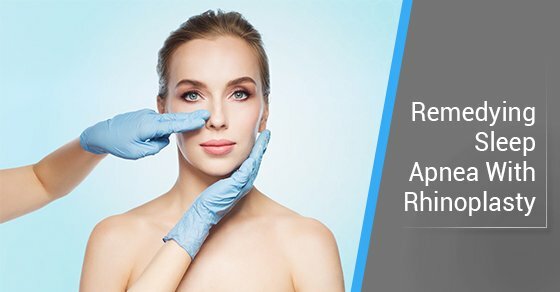 Lifestyle changes and mouthpieces are among the current treatment methods, but could rhinoplasty also be a solution? The short answer is that functional rhinoplasty — rhinoplasty that is not designed for cosmetic reasons — can improve sleep apnea. In fact, in some cases it may even be considered a solution. Sleep apnea occurs due to a blockage in the way oxygen is delivered to the brain. Possible risk factors include narrowed airways and chronic nasal congestion. Functional rhinoplasty has been shown to make sleep apnea less severe in those suffering from obstructive sleep apnea, the most common type. These findings were published in the journal Plastic and Reconstructive Surgery in 2015. The results of the study also found that functional rhinoplasty was better than typical treatment methods such as the CPAP mask, as well as throat or facial surgery. This is positive news for those suffering from sleep apnea. While functional rhinoplasty may be effective for some individuals, it is important to know that rhinoplasty is only effective for individuals whose sleep apnea is a result of a nasal blockage. Some people may have sleep apnea because of other reasons. If you are interested in undergoing functional rhinoplasty in order to improve sleep apnea, consider Dr. Oakley Smith. He is one of the best plastic surgeons in the country and the only one in Ontario that concentrates exclusively in the area of rhinoplasty. Contact his clinic today for a consultation.